"This is my last night here [Tinajas Altas]. Tomorrow, Win comes with the horses and I shall go home as quickly as possible. But I will not forget these mystical nights, sitting alone here in camp in the moonlit desert. The calm, the silence, the radiance of the mountains, the softness of the light and the mystery pervading the scene. My trip has been completely successful…. The sunsets have been wonderful, especially tonight, with the lighted clouds changing from golden to crimson to pink, all seen through the vistas of the craggy mountain masses. As I look out on the desert by moonlight, it seems so soft and hospitable. The sense of its death-dealing aridity is lost. I shall hunt for an hour at daylight and that will be my last. Then all my thoughts will be centered on home." Mile 0.0. 32°19’31.1"N, 114°02’59"W. Key Junction at sign A-16. Go north (straight). Mile 0.3. 32°19’49.8"N, 114°03’00.3"W. Junction: go north. Faded BLM sign announcing Tinajas Altas. Also sign C-19. Other, wider road goes southeast and is a bypass for vehicles not wanting to visit Tinajas Altas. Mile 1.1. 32°20’30.3"N, 114°02’59.5"W. Sign C-18. Side road northwest to the mountain. Not closed to the public. Good camping sites can be found along the route. As you go…. Miles 1.2 to 1.9: Cholla forest, highlighting teddy bear cholla, diamond cholla, and others. A wash at Mile 2.3 features ironwood trees, occasional mesquites, horsfordia and desert lavender. Mile 3.4: Junction C-17. A dead-end spur. Continue straight. As you go…. Miles 4.3 to 5.9: From road to apartment house. Piles of sand removed from the road by a maintenance crew have been colonized by a variety of rodents and plants. Mile 4.5: Junction C-16. A dead-end spur. Continue straight. Mile 5.9: Junction C-15. A dead-end spur. Continue straight. Mile 6.6. 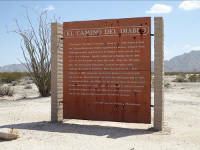 32°25’06.1N, 114°04’51.8"W. Historical footnote: the concrete pad and posts along the west side of the road once marked the inclusion of Tinajas Altas within Cabeza Prieta National Wildlife Refuge. For a short period in the 1970s, 80,000 acres were added to the Cabeza Prieta National Wildlife Refuge as part of a BLM land swap, later reversed by Congress. At that time BLM managed the natural and cultural resources of the Range, as the Marine Corps now does. The annex ran from here to the international border, and westward nearly to the Butler Mountains. "The Road of the Devil is a rough, unpaved route which begins in Altar and Caborca Mexico and crosses southwestern Arizona, ending in Yuma. Prehistoric peoples used the route to transport shells and salt from the Gulf of California. Spanish soldiers led by Melchior Diaz in 1540 were the first Europeans to travel this route. More than 150 years later, the Jesuit priest, Father Kino, traveled the region while exploring for routes to California. After the discovery of gold in California in 1849, thousands traveled the Camino in search of gold and new lives. Historians estimate more than 400 people died of thirst on the Camino during the 1850s. At one time, at least 50 graves could be identified along the route. Today the area (part of which is listed on the National Register of Historic Places) is under restoration. Please stay on the road and help us protect this historic resource." Mile 7.5. 32°25’49.4", 114°05’13.0"W. Junction C-14 and a trail to Raven Butte, a distinctive mound of Miocene basalt. It was probably named for its raven-black color, though one source who never saw it said it was named for ravens living in the area. Mile 9.4. Signpost C13 and trail to southwest. Continue straight. Mile 10.0. 32°27’52"N, 114°06’17.5"W. Cipriano Pass junction and signpost C-12. Continue straight (northwest). Road to southwest takes you to Cipriano Pass. Also sign S-56 for a military bivouac site. Pass may be named for Cipriano Ortega, head of a family hacienda near Santo Domingo along the Sonoyta River in Sonora, but it is not to be confused with Cipriano Pass or Cipriano Hills in Organ Pipe Cactus National Monument. The Ortega family sometimes drove cattle from Sonoyta to Mexicali, Mexico, and freight wagons to Yuma. Mile 10.7. Military bivouac site S-55. Continue straight. As you go…. Miles 10.7 to 11.3: Note grass, mallow, white bursage, and white-stem milkweed (Asclepias albicans), plus diamond cholla (Cylindropuntia ramosissima) growing in runoff runnels. Even ironwood trees (Olneya tesota) and other large plants grow along them. The runnels flow across the roadway, but road grading blocks or re-channels them, leaving plants on the downstream side of the road with less water and affecting their growth. If you walk along a runnel, you’ll find animals seeking shade and food. The functions and values of runnels are analogous to riparian habitat. Runnels also nourish cryptobiotic soils, and their growth patterns on the ground may reveal where rainwater runs or pools. Mile 11.3. Road widens a bit. Mile 11.5. Junction C-11 and military staging area S-54. Heed laser warning signs from here to C-8. Do not hike or drive west of the road. Mile 12.5. Military bivouac area S-53 to the west. Continue straight. At certain times of the year, large contingents of Marines camp along this road in military training exercises such as the Weapons and Tactics Instructor course (WTI), an advanced tactical aviation exercise designed to train weapons and tactics instructors. Mile 13.0 . 32°30’11.9"N, 114°07’45.5"W. Junction C-10 and the eastbound Hobbs Drag Road, a Border Patrol sign-cutting trail named for agent Kenneth Hobbs who hailed from Sonora, Texas, and pioneered the road in 1967-1968. Agents regularly sweep the trail smooth with a drag-harrow of old tires pulled behind a vehicle at slow speed, leaving a tabula rasa where agents can "read" subsequent tracks made by people or vehicles. Tracking is an old art, taking years to master, and out here it has saved many migrant lives. Mile 13.9. Junction C-8 and trail west to S-52. Do Not Enter laser hazard area. Continue straight. Mile 14.1. Area S-51. Continue straight. Mile 14.5. Junctions C-6 to west and C-7 to east. Continue straight. Mile 15.0. 32°31’41.3"N, 114°08’49.4W. Junction C-5. Road west goes toward mountains and various campsites. Continue straight. Mile 15.0. This hulk of an armored personnel carrier has become a local landmark. Mile 15.1. Junction C-4. Continue straight. Mile 16.2. 32°32’24.9"N, 114°09’26.9"W. Roadside patch of hollyleaf bursage (Ambrosia ilicifolia), defined by holly shaped leaves and large size. Plants survive here by many means: spines or stickers for protection, foul taste, drought tolerance, and this plant uses them all, plus its seeds have "hooks" that attach to animal fur and are dispersed far and wide. Its leaves can be green following rainy seasons, though this region receives only 3 to 4" of rain a year. Hollyleaf bursage is different than desert holly (Atriplex hymenelytra), a beautiful yet hardy plant found on the western side of the Gila Mountains. Mile 17.2. 32°33’24.6"N, 114°09’59.3"W. Junction C-2. A power line and road head north. Continue straight north-northwest on main road. Note that ocotillos (Fouquieria splendens ssp.splendens) here are the dominant tall plant, with only an occasional ironwood tree (Olneya tesota) that is growing more like a shrub than a tree. Shorter shrubs include white bur-sage (Ambrosia dumosa), brittlebush (Encelia farinosa), cheesebush (Ambrosia salsola var. pentalepis), and creosote, with an occasional cholla (Cylindropuntia fulgida var. fulgida) or saguaro (Carnegia gigantea). Cryptobiotic soil crust holds the soil and keeps it from blowing away. Mile 21.4. Large encampment area for military training. Sign S-50. Two wooden temporary buildings stand in stark contrast to the bare ground. Mile 22.3. 32°37’11.1"N, 114°12’38.1W. Key Junction "C" and Goldwater Range northern boundary. Occasionally this is a bustling intersection as various Marine Corps units deploy to the field and their heavy equipment is delivered by commercial trucks. The training exercises vary from deployment of remote communications units to large field camps to combat units complete with defensive "missiles" and electronic or laser countermeasures and locators. 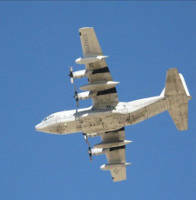 Pilots of various aircraft train in close coordination with ground troops and observers. Rugged Gila Mountains to the west meant that westbound travelers had to go around them by way of Dome and the Gila River valley, or find one of the very few passes through the range (Cipriano Pass), or skirt them by going far south to Tinajas Altas Pass. In modern times the highway over Telegraph Pass has solved this problem. From here there are two easy routes home, one directly to Wellton and the other directly to Yuma.